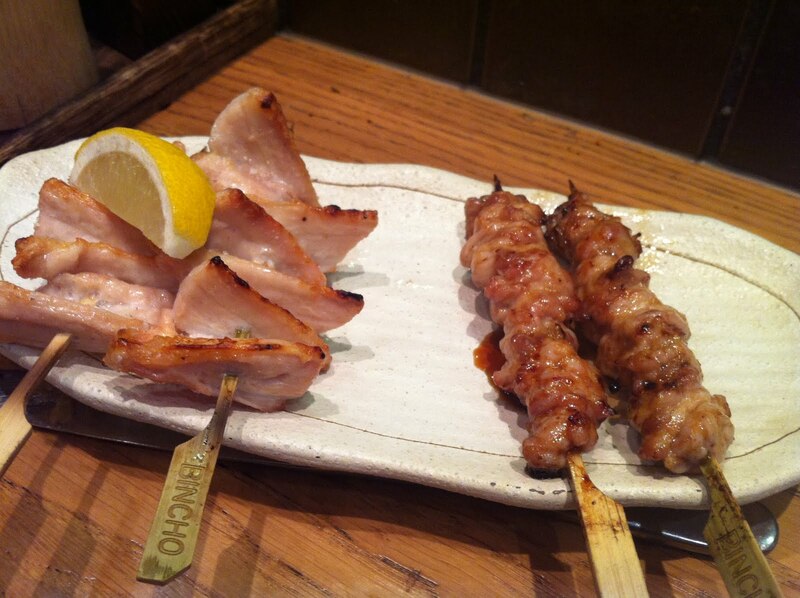 I must have walked past Bincho Yakitori a hundred times on my way into Soho and never given it a second glance. It's not really that inconspicuous or tucked away; perhaps because it's over road from the neon monstrosity of Ed's Easy Diner, or its refined Japanese dark wood and clean lines is rather at odds with the flamboyance of Old Compton Street, but it's just not the kind of place that grabs attention. It looks superficially like a dozen other Japanese restaurants in the area - not unattractive, not even unassuming, but perhaps unpromising. And I would have very probably carried on ignoring it were it not for the discovery (thanks to Lizzie) of this, a fascinating and beautifully photographed blog apparently written by the Bincho head chef. I wish more restaurants would write blogs. I can understand why they don't, of course; I'm sure it's hard enough running a successful business or spending 12 hour days in a prep kitchen without having to find time to write 1000 words on an experimental new dish or whip out the SLR in the middle of service, but for a restaurant geek like me the inside information is gold dust. 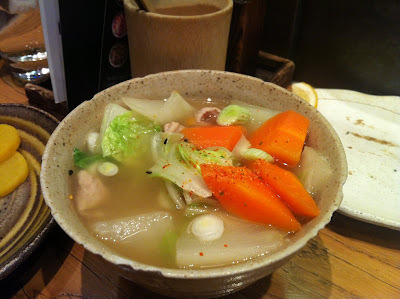 So off to Bincho we went, determined to try most if not all of the exciting "off-menu" items detailed on the blog. 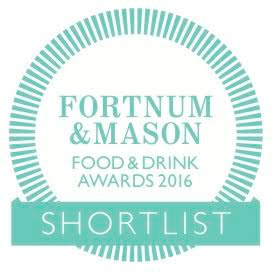 But first, some top quality pickles, yellow turnip of some kind with an interesting pungent flavour. Our waiter said the pickle selection on our visit was a bit more limited than usual, but made up for it by knocking 50% off these ones and giving us twice the amount. Excellent. 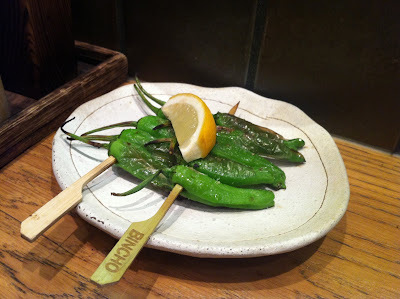 Shishito turned out to be a slightly elongated, Japanese version of padron peppers, crunchy and salty and smoky. Also around this time a pig's tripe and miso stew arrived, which had gorgeously (for want of a better word) porky stomach meat and a great rich broth. 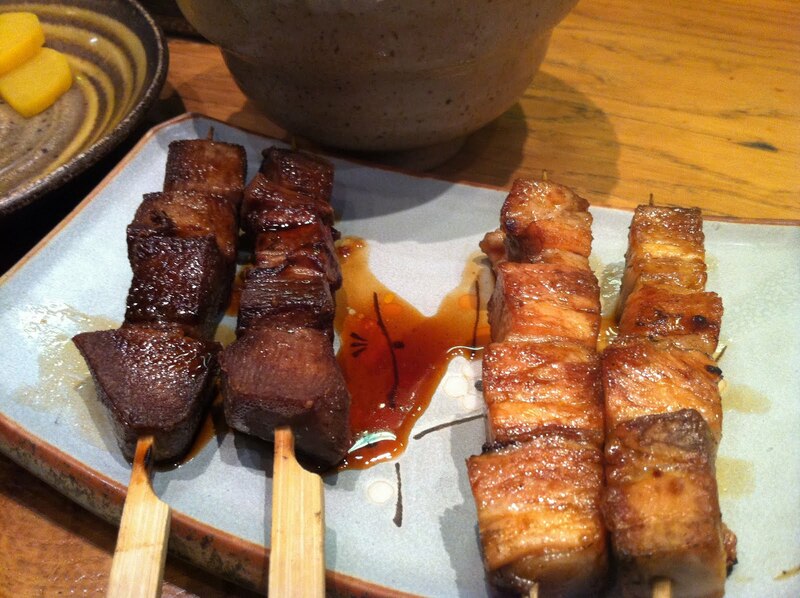 First of the yakitori proper were beef tongue (tender and, er, beefy) and a fantastic pork belly version, which alternated between crispy, fatty and meaty as you worked your way through. In contrast to a rather disappointing lunch at Mino Kitchen a few weeks back, the tare sauce here was very sparingly used to season and glaze the meat rather than overwhelming it or becoming sickly. 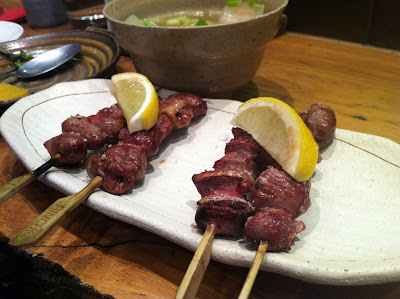 Unusual chicken bits seem to be a feature of yakitori restaurants generally, and so it was here. Chicken hearts were superbly tender and richly flavoured - a delicacy in the strictest sense of the word - although I'm afraid I've decided that the gizzards (on the right) aren't for me. Alarmingly crunchy and without any particularly worthwhile flavour, I doubt I'll bother with these the next time I have a craving for Unusual Chicken Parts On Sticks. More chicken came in the form of chicken oysters - a little nugget of dark meat just near the base of the thigh often only found on good quality, free range birds. What they lacked in the flavour hit of other cuts they made up for in a delightful texture contrast between the crispy skin and soft flesh beneath. On the right are stuffed mushrooms, which perhaps weren't massively interesting but we had to make some token nod towards a balanced meal. It was just as we decided that as we were having so much fun we should probably order some more food, that our waiter announced the kitchen had finished prepping Seseri. 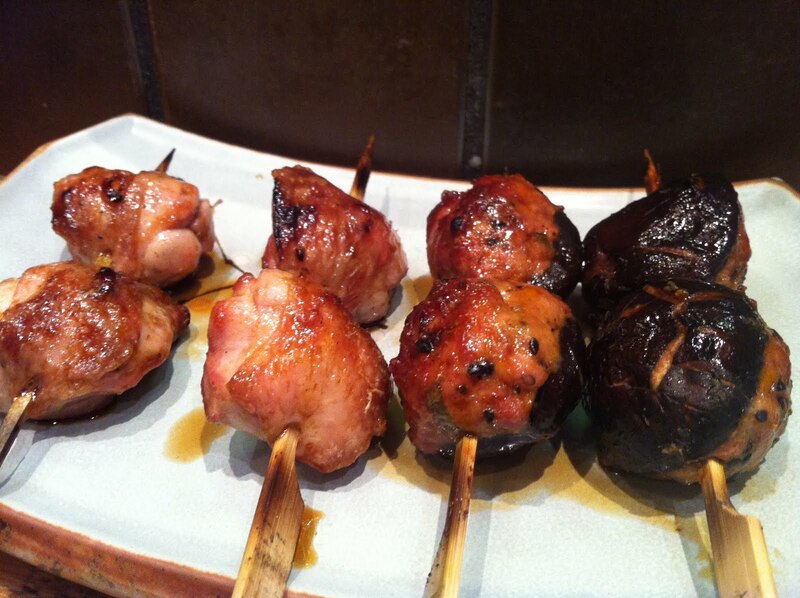 These are chicken neck skewers (right), and according to their blog their production is "nothing short of torture" (for the chefs, we hope, not the chickens). Well we wouldn't like to see all their hard work go to waste, so we had a couple, and very nice they were too, with a pleasant "noodly", loose texture and the flavour of dark chicken meat. 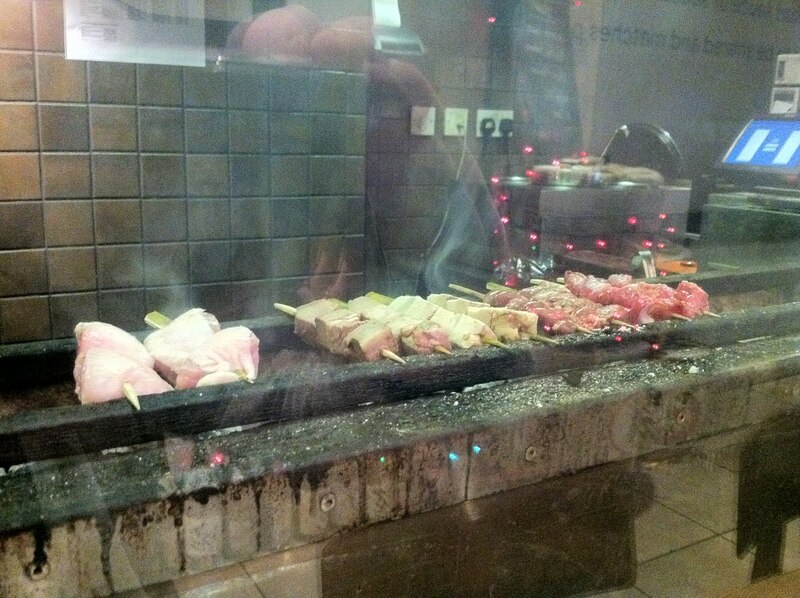 Even better though, in fact my favourite item overall, were grilled chicken cartilage. If it sounds a bit challenging, then you're not wrong - crunching away on the bit of the chicken you'd normally throw away is a very odd sensation, but you're rewarded with the most extraordinary concentrated flavour, shockingly good. A bill of £42 for two seems perfectly reasonable for this amount of food, especially bearing in mind the huge effort that goes into preparing some of these unusual cuts. 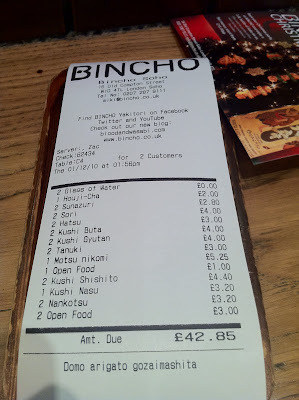 They don't automatically add service (another plus point) so we added on a few extra quid and left very happy indeed with our lunch. 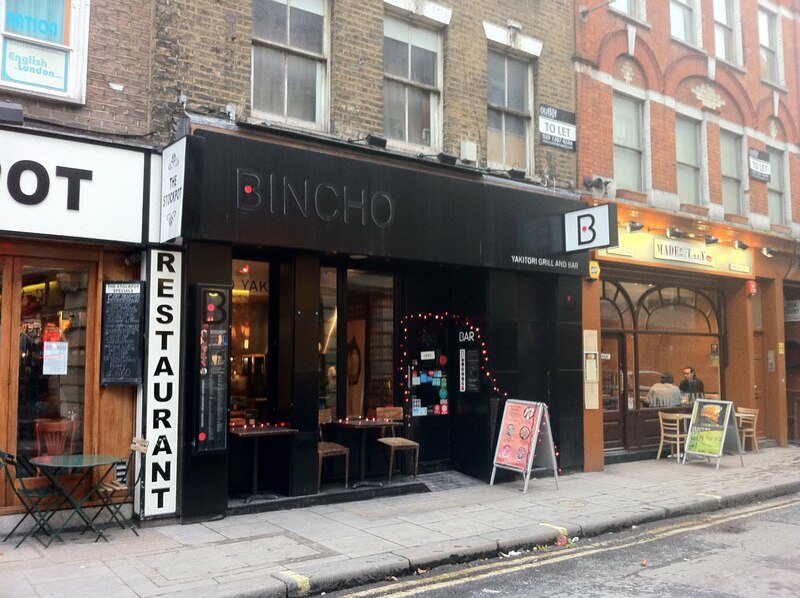 Bincho is a rare example of a restaurant unafraid of introducing Londoners to unusual and audacious Japanese textures and flavours, and is doing so in an unintimidating, straightforward way that won't break the bank. I will return. Was just commenting on Lizzie's blog that when I went our favourites were the tongue, pork belly, chicken oysters and chicken hearts - so similar eating to you. Cartilage sounds interesting. We managed £60-£70 a head though but we did drink a lot. I think you enjoyed the cartilage more than I did... no idea why it's taken me this long either; I'm definitely going back for beers and sticks. Service at Bincho is fantastic and they do a superb pre-theatre menu...though it does feature some of the less interesting parts of the chicken. Is that Stockpot next door? Now that's a PROPER restaurant. Any crunchy chicken bits served there are just a kitchen fail. I did not get to order the cartilage when I was there but I had the chicken skin which would satisfy any fried food lover's cravings! Would definitely head back to Bincho but more for their meat than their veggie on sticks! You're visiting a few of my local favs lately, Chris! Like you, I didn't hold high hopes for this one judging from the look from the outside (and probably its location) but a friend who knows his stuff about where to eat in Tokyo visited and gave it the thumbs up which is why I eventually ventured in - I have to agree, I think it is a great little place. Glad to hear you and Lizzie liked it, Bincho is one of my fav Soho places. Was gutted when they closed their South Bank restaurant, it had great atmosphere and wonderful view of the river (and also cleverly located a 10 minute walk from the Livebookings offices...). Surprised you didn't try anything from their selection of Sake. :) They have this great way of serving it in a glass in an open wooden box and filling the glass until it completely runs over into the box. Sounds good. 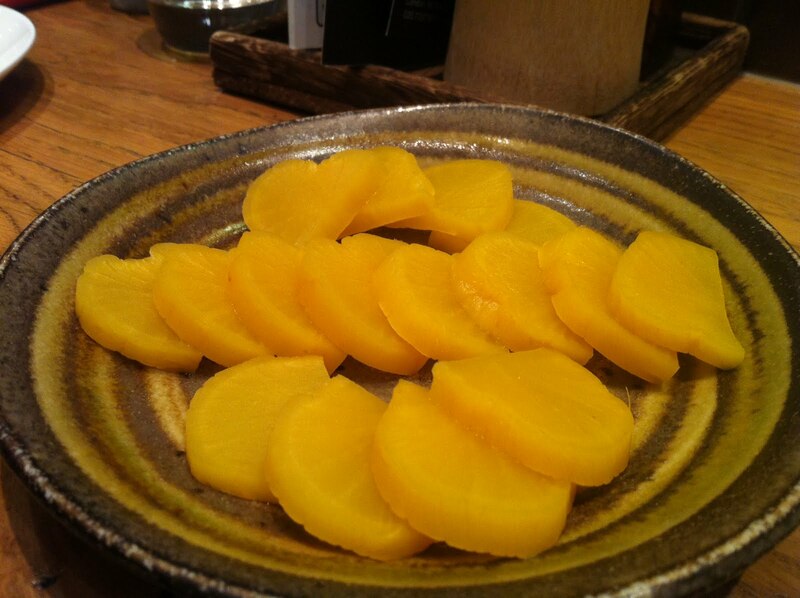 Those pickles look like regular ol' daikon radish. I think the yellow comes from turmeric during the pickling, but in any case, you can buy them (pickled daikon) at most Asian food shops. Slightly elongated Japanese padron peppers? oh, hello. I'm there. Thanks for this post educating to the "Yakitory world" !